Newly-narrowed South Joyce Street in Pentagon City is losing a few parking spaces to make way for trees. Over the winter, crews narrowed the portion of Joyce Street from 15th Street to 16th Street. 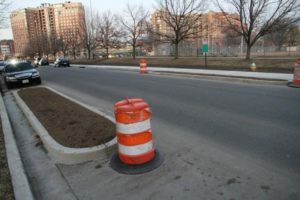 A sidewalk was added to the side of the road facing Virginia Highlands Park, and the width of the street was reduced from 40 feet to about 35 feet. The changes were intended as traffic calming measures. Narrower streets, the county says, encourage drivers to slow down. To slow traffic down even more, Arlington has added six car-length planters — three on either side of the street. Trees will be planted in the planters, which each take up what was once a parking space. “They serve to visually narrow the roadway on a very long stretch that is not interrupted by intersections,” said Traffic Engineering and Operations Bureau Chief Wayne Wentz. Wentz said that while one side of the street has cars parked on it throughout the day, the other side sometimes lacks parked cars. The empty parking spaces, in turn, make the street appear wider and result in people speeding up. The planters, Wentz said, will do the job of calming traffic even when parked cars aren’t present. Wentz noted that the roadwork actually added two parking spots to South Joyce Street, so the net loss of parking is only four spots. But one resident worried that park-goers may soon be forced to leave their cars in the adjacent neighborhood. The construction was paid for by money set aside by the developer of the nearby Pentagon Row shops. “The changes to Joyce Street were actually development conditions of Pentagon Row,” Wentz said. Wentz expects the trees to be planted by mid-April. The county’s arborist will decide which type of tree will be planted. 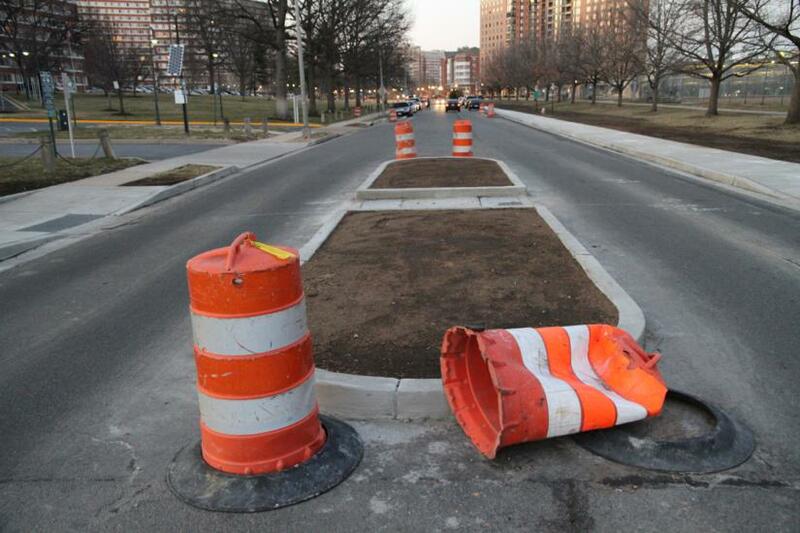 In addition to the six planters on the side of the road, road crews also added a planter in the middle of the road at a pedestrian crossing.